Klein Sun Gallery is proud to announce Art Hacker, a solo exhibition by the world-renowned Chinese artist Liu Bolin, on view from November 17 through December 23, 2016. The exhibition marks Liu Bolin's shift towards the virtual world, exploring this new territory artistically through Post-Internet Art. 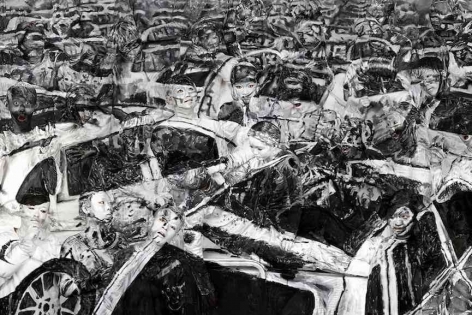 This new body of work consists of appropriations of classical Masterpieces — da Vinci's Mona Lisa, Picasso's Guernica — juxtaposed with a photograph of the devastating impact of the Tianjin explosions. Using complicated and precise hand-painted camouflage, Liu Bolin painstakingly recreates these images with scores of human subjects as his canvas. Through various methods, Liu Bolin's new photographs have replaced the three subjects on numerous websites, which were targeted with image-search results on Google and Baidu, thus realizing the Hacker project. 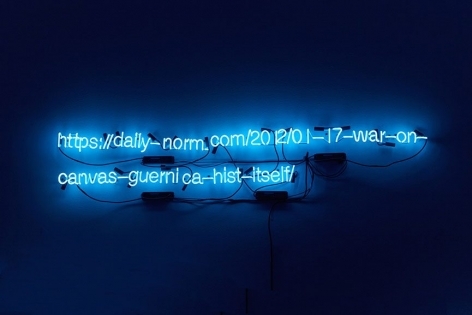 Neon installations of the URLs exhibited throughout the gallery pound home the transitory and delicate nature of the internet. 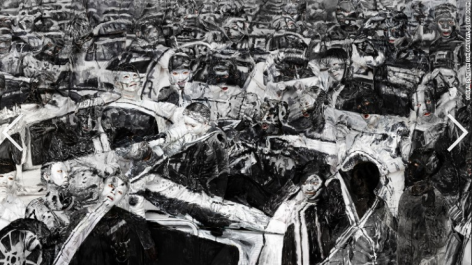 Recreating the imagery of human suffering and devastation of war symbolized in the painting Guernica, Liu Bolin’s relives the history of the Spanish civil war, making a plea for humanity and freedom. 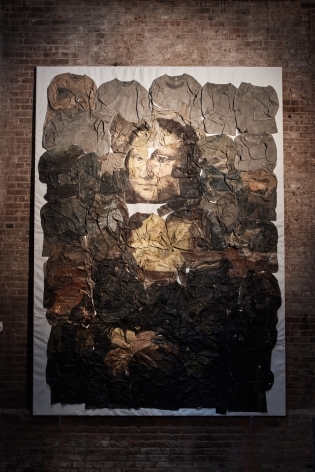 In Mona Lisa (2016), Liu Bolin imbeds himself into the masterpiece as well as its historical legacy. 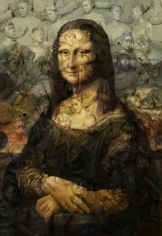 Touching upon the fact that the work was stolen from the Louvre more than 100 years ago, Liu Bolin aims to reenact the “disappearing and reappearing” of the work through techniques behind the network. 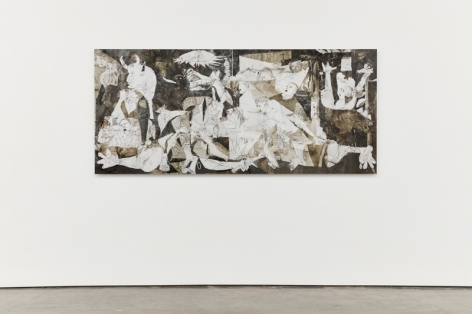 Provocatively challenging the viewer to question what is above and beneath the surface, the work intends to reflect upon the complex relationship between the past and the present, the reality and the illusion, as well as individuality and history. 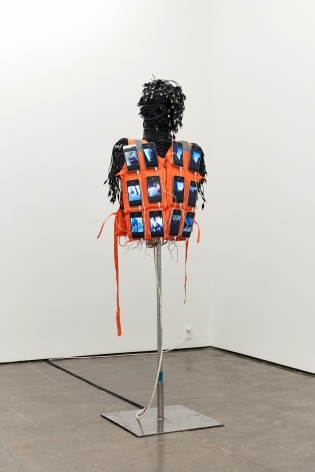 Not only utilizing and analyzing the impact of the Internet, Liu Bolin also delves into other aspects in digital realm, blurring the boundary between art and technology evident in his installation Livestream Vest (2016). 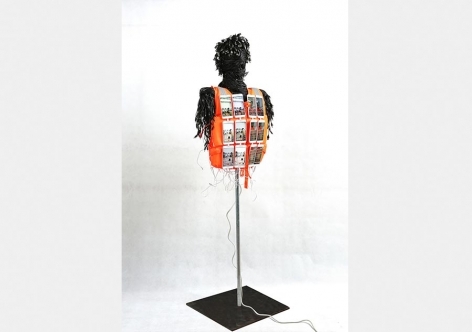 Attaching multiple smartphones onto a life jacket, the artist turns on the front cameras for unstoppable live-streaming. Reflecting and broadcasting what is happening while moving around, Liu Bolin merges into the environment mirrored on the vest. The work, therefore, becomes a quasi-invisible jacket wherein the artist turns into part of the social environment. 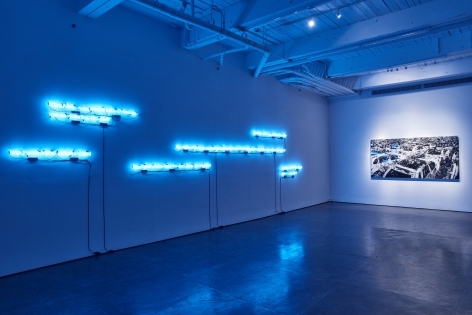 Employing physical and hyperlinked images, the exhibition explores the theme of illusionism. 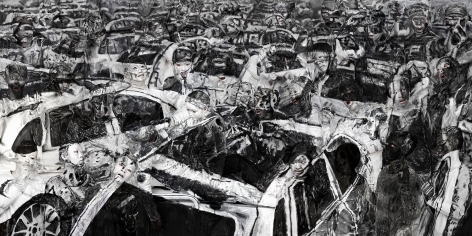 Actively “disappearing and reappearing,” Liu Bolin issues an urgency through his works. 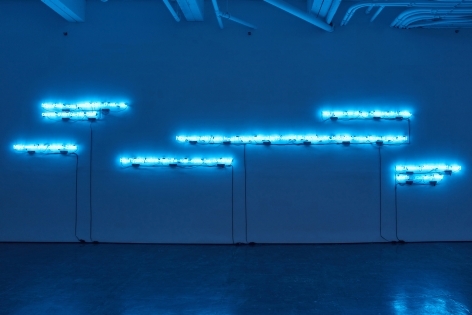 Engaging with both online and offline formats, the artist foregrounds the man-made, the fabricated, and the deceptive, through which he probes into the mass production and circulation of information, and also questions where the power lies in today’s ubiquitous networking. Inner Journeys, Maison Paticulière Art Center, Brussels, Belgium (2013); Harper’s Bazaar: Inside the Magazine, Yermilov Center, Kharkiv, Ukraine; Korobchinskiy Center, Odessa, Ukraine; Izolyatsia, Donetsk, Ukraine; Museum of Modern Art, Kiev, Ukraine (2012); Performing for the Camera, Arizona State University Art Museum, Tempe, AZ (2012); Changement de Décor, Festival des Arts Visuels de Vevey, Switzerland (2012); Scenes from Within: Contemporary Art from China, Biennale della Fotografia, Bogotá, Colombia (2011); Black and White, Zero Art Center, Beijing, China (2011); Exhibition of the Neuflize Collection MAC de Marseille, Musée d’Art Contemporain de Marseille, France (2011); The Right to Protest, Museum on the Seam, Jerusalem, Israel (2010); The Big World: Recent Art from China, Chicago Cultural Center, IL (2009); Animamix Biennial, Shanghai MoCA, China; Taipei MoCA, Taiwan; Today Art Museum, Beijing, China; Guangdong Museum of Art, Guangzhou, China (2009); International Contemporary Art Invitational Exhibition, Seoul Art Museum, Korea (2009), and Les Rencontres d'Arles, France (2007). Liu Bolin's work is included in highly prestigious individual, corporate, foundation, and museum collections worldwide. 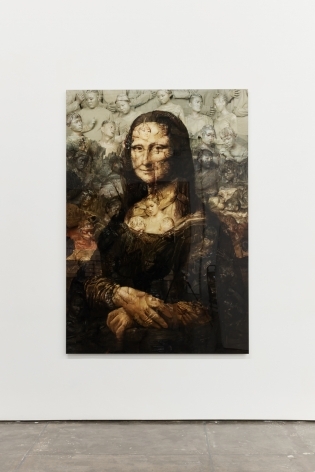 Art platform "An Optical Illusion" highlights Liu Bolin's depiction of the Mona Lisa in his solo show "Art Hacker." Blouin Artinfo highlights Liu Bolin's solo show "Art Hacker" and his experimentation with "post-internet art." 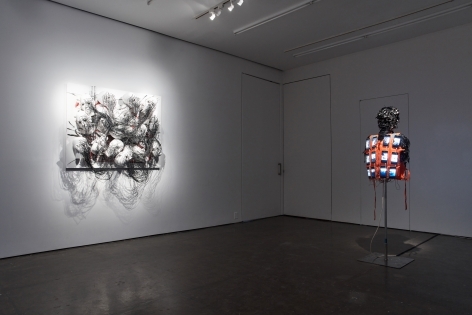 Curatorial and artist platform Critical Distance features Liu Bolin's solo show "Art Hacker" at the Klein Sun Gallery. 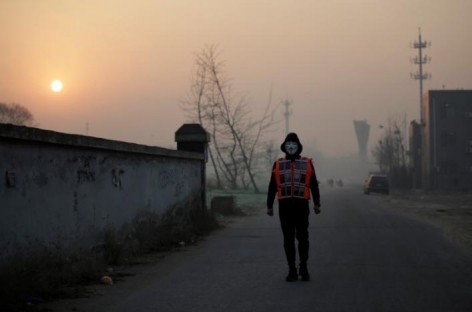 The New York Times article features Liu Bolin's Live Stream Vest documenting the smog in Beijing which he calls "a disaster." 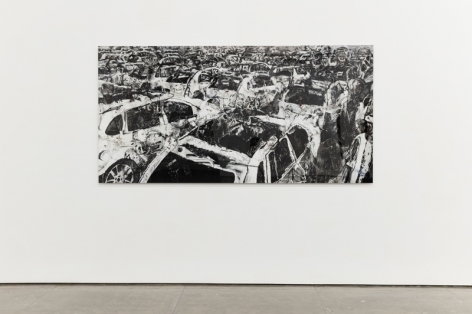 California-based lifestyle website features Liu Bolin's solo show "Art Hacker" at Klein Sun Gallery. 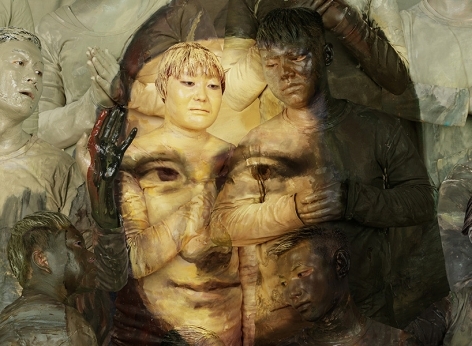 Online article explains Liu Bolin recreations of classical masterpieces by painting camouflage onto human subjects. 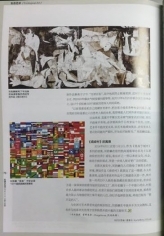 Chinese Magazine "The Green Living" writes about Liu Bolin's individual interest in Western culture and other related subject matters. 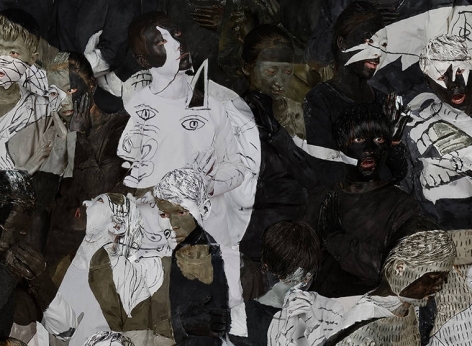 Exploring the online environment, Liu Bolin questions concepts of illusion and reality. 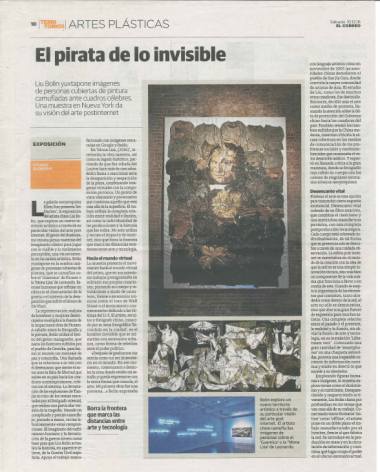 Spanish magazine features Liu Bolin's solo show "Art Hacker" at Klein Sun Gallery. Q&A with Widewalls and Liu Bolin uncovers his process and what has made him the internationally famed artist that he is today. 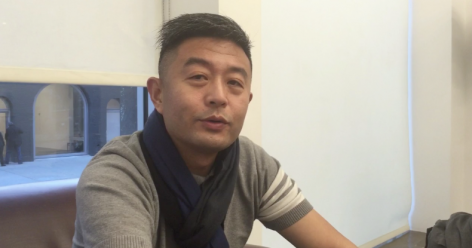 A Q&A with artist Liu Bolin about his solo show "Art Hacker" at Klein Sun Gallery. Designboom features Liu Bolin's "Art Hacker" as one of the "Top 10 exhibitions of 2016." The China Press interviews Liu Bolin about his solo show "Art Hacker" at Klein Sun Gallery, featuring new photographs and installtion works. CNN Style credits Liu Bolin's unique medium and continued reference to political and social issues. 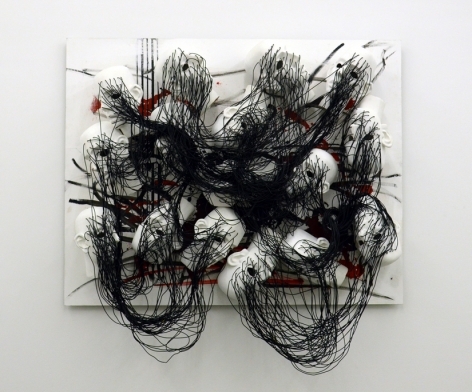 Portuguese fine arts platform Mistura Urbana writes about Liu Bolin's solo exhibition "Art Hacker" at Klein Sun Gallery. 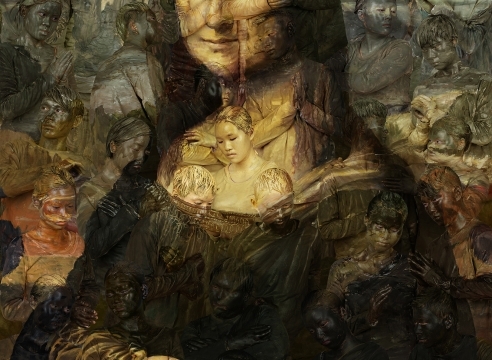 Liu Bolin uses human figures as his canvas to reinterpret two classic paintings. 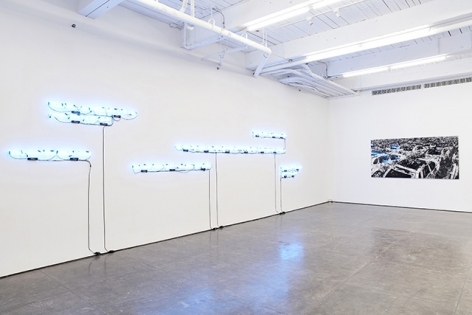 Art and technology platform Ufunk features Liu Bolins "Art Hacker" on their website. China Daily discusses Liu Bolin's interest in technology and how it affects our lives. 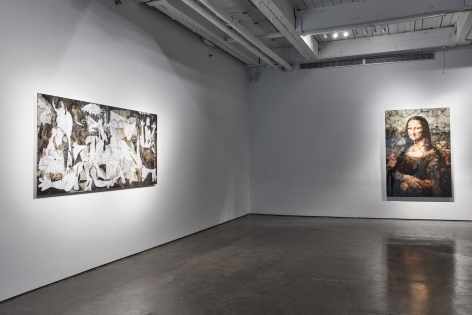 French art platform Fubiz celebrates Liu Bolin's use of old masterpieces in his current solo show at Klein sun Gallery. 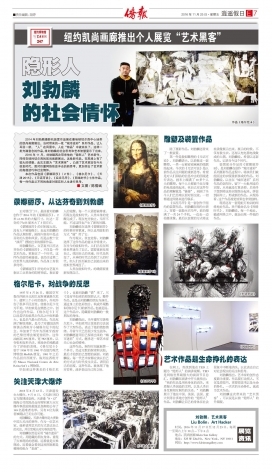 An article explaining the juxtaposition between Liu Bolin's use of classical masterpieces and his image of the Tianjin explosion. Art and technology platform Designboom writes about Liu Bolin's exploration of 'disappearing and reappearing' in his work. Liu Bolin analyzes the impact of the internet in his solo exhibition "Art Hacker" at Klein Sun Gallery.